Made with high quality wicker, it will be easy to match any decor you have in your backyard. With its modern design shape, you can place it near your seating area to place snacks and beverages, and also can use it as a little storage bin to put some magazines, cell phone, etc. 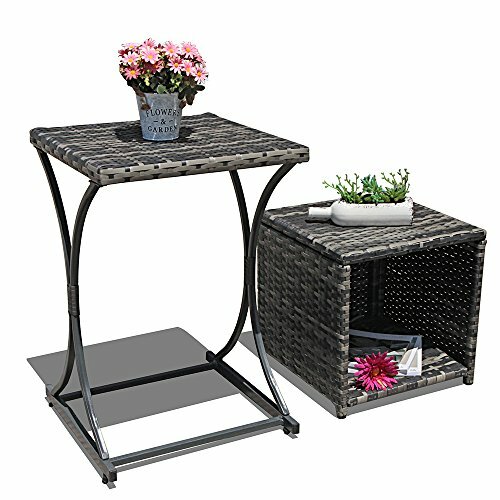 The OC outdoor wicker side table set is stylish and convenient for your outdoor needs. Made of PE rattan and durable rust resistant steel frame, all weather wicker design make it easy to clean and long-lasting use. Two sets of side table, the small one can be used as storage box, footrest, side table and so on. Free combination to meet your leisure needs. Make a great addition to your patio decor with this outdoor wicker table. beautiful color easily complements your outdoor living space. Sturdy but lightweight metal frame is convenient place to meet you leisure time, maintenance-free patio coffee table. If you have any questions about this product by OC Orange-Casual, contact us by completing and submitting the form below. If you are looking for a specif part number, please include it with your message.